Mixing concrete isn’t the most difficult process, but it does take a small amount of know-how in order to achieve the best and most effective results. It’s important to understand the difference between ready-mix and concrete mix. It’s good for both professional contractors and DIY home improvement tacklers to know these things, too. For DIY or at-home projects, concrete mix takes the right amount of water; for large-scale jobs, ready-made mixes are perfect. However you do it, mixing concrete effectively also demands the right equipment. As with all projects, wear protective gear, covering as much skin as possible, since concrete can burn the skin if it sets in. 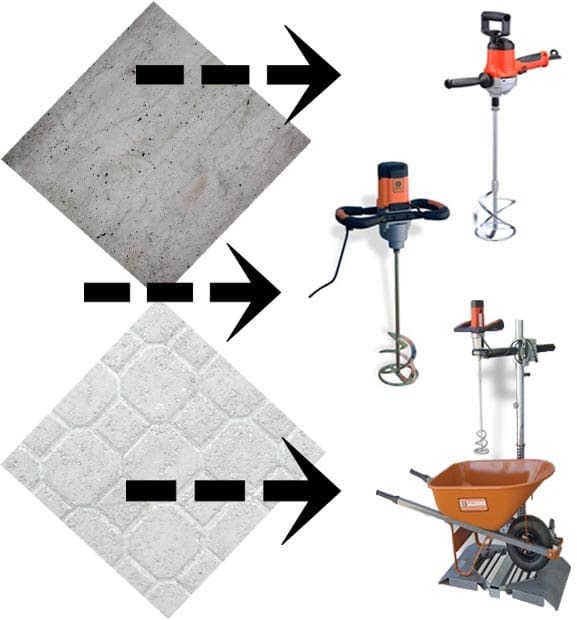 Ready to tackle a concrete project? Take a look below at the mixers and paddles that will make your life easier. The BNR6169 Paddle Mixer is a simple handheld mixer with 1050 watt that has a mixing capacity of 20 gallons. Great to keep on hand for household projects. The BNR6400 Power Mixer, 1800 watt; handheld. Perfect for the portable ramp mixer below, this mixer comes with a 1.2″ drill motor that doesn’t have to be replaced as per usual for standard motors. The BNMG-6100 Mixing Stand, which includes ramps, has a spring counter weight system, a ramp on either side so that you can roll up a wheelbarrow; it folds up to 2′ x 5′ and it is designed to an 1800 watt mixer that will get any mixing job done.